It's not just the violent death but also the incendiary life of Malcolm X that is the subject of this pungent documentary, which makes its points viscerally and stylishly. As a biographical piece, it can be a little myopic�unless you've already got a good strong working knowledge of the internal politics of the Nation of Islam circa 1965, you may be a little at sea from time to time�but director Jack Baxter has tracked down archival footage, and has conducted interviews with many of those who new Malcolm best, in his last years especially, and his film is deeply evocative of Malcolm's life and times and influence. Roscoe Lee Browne narrates the film, which takes us through Malcolm's early years pretty swiftly: born Malcolm Little, he served time in prison, had a conversion experience, and turned for spiritual guidance to Elijah Muhammad, leader of the Nation of Islam. Was this a sect, a cult of personality around Elijah Muhammad, or the means by which those so long oppressed in the United States could reclaim their rights and heritage? That's sort of the crux of the matter. Malcolm starts out a true believer, Elijah Muhammad's most public soldier; he later became disenchanted by the cronyism and corruption in the Nation of Islam, and his differences with Elijah Muhammad, and especially with his sons, may have been responsible for Malcolm's death. Baxter documents Malcolm's pilgrimage to Mecca, a transforming experience; there's also the suggestion that Malcolm might have tailored himself as a martyr, refusing bodyguards in the face of frequent threats on his life. His enemies were many: the Nation of Islam saw him as an apostate, J. Edgar Hoover's FBI saw him as a constant threat, and kept him under endless surveillance. (Given Malcolm's contentious relationship with federal law enforcement, then, there's a certain irony to the presence of the FBI copyright warning that you're forced to watch before the feature begins on this DVD.) Coming under particular scrutiny here is Gene Roberts, an undercover cop who insinuated himself into Malcolm's inner circle; he is interviewed, and is sorrowful, if unapologetic. The circumstances of Malcolm's assassination at the Audubon Ballroom on February 21, 1965 is given intense scrutiny here. 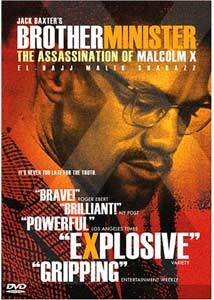 The film doesn't take sides, exactly, but the footage of Louis Farrakhan discussing the assassination is chilling. See the quote at the top of this review, which is hard to read as anything other than Farrakhan's acknowledgment of his complicity in Malcolm's murder. That doesn't leave everyone else with clean hands, though, particularly local and federal authorities, who were sanguine about the killing at best. Baxter makes a couple of technical missteps, though, I think, first with having actors re-create that night in northern Manhattan. These clips have a falseness to them; they seem dull and fake, especially when juxtaposed with a blurry still photograph from that night of Malcolm's bullet-riddled body. Also, since all of the archival footage is in black and white, Baxter begins his new interviews in the same way, and then a few seconds into them fades into color. It's modestly effective the first time, but it becomes the signature style of the piece, and is very, very annoying. Image Transfer Review: A pedestrian transfer, with more than its share of scratches, and faded, blotchy colors, even in the newer footage. Audio Transfer Review: A good amount of static and a raw quality to much of the footage can make this one an occasional tough listen. Extras Review: A 2005 interview (23m:12s) with James 67X, one of Malcolm's closest associates, is a freewheeling conversation about the African American experience in America in general, and about Malcolm's legacy in particular. And in a featurette (11m:57s), director Jack Baxter talks about the long history of the project, and discusses its impact�on the day of the film's theatrical release, Malcolm's daughter was arrested for her alleged involvement in a plot to kill Farrakhan. A worthy account of the riveting life and barbaric slaughter of one of the crucial figures in twentieth century American history.